PLEASE JOIN THE WAITLIST BY CLICKING HERE. If you enjoy exploring and learning about our local ecology, engaging in citizen science, and sharing your knowledge with others, this program is for you! The 40 hour course combines a science curriculum with guest lecturers, field trips and project-based learning to explore the unique ecology and natural history of inland Mendocino County. Lead course instructor is Jennifer Riddell, PhD. Local guest experts will attend classroom sessions and field trips. Meeting Days & Times: March 13 –May 18 2018, 6-8:30pm. Wednesday evening classes meet at the UC Cooperative Extension Office in Ukiah. 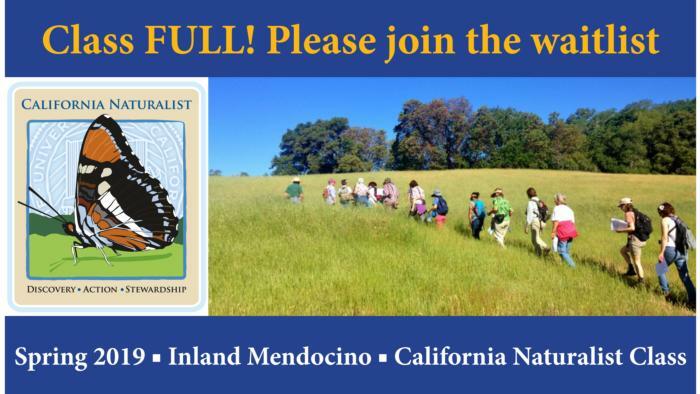 5 Saturday field trips held at the UC ANR Hopland Research and Extension Center and surrounding areas from 8:30am–2:30 pm and include one overnight. Fee: $390 by January 31, $410 Feb 1-March 14. This class will fill with a waitlist- sign up early! Need-based scholarships available. Registration opens soon. Students must purchase The California Naturalist Handbook (2013, UC Press).